As I stated in my interview with Moving America Forward host Doug Llewelyn, one of the biggest challenges in anyone’s life is to go from working, receiving a paycheck, and saving money your whole life….to no longer receiving that paycheck for the work you do. And, to make matters worse, you then have to begin “spending” the money you’ve taken your entire life to save. That just doesn’t feel “normal” to anyone. In fact, it feels strange! 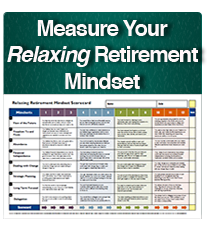 What I’ve witnessed coaching retirees over the last 25 years is that in order for you to begin spending the money you’ve saved over your lifetime, and truly enjoy yourself, it requires a lot of financial confidence. In years past, when guaranteed monthly pensions were the norm, you could retire confidently knowing the precise amount of monthly income you could count on for the rest of your life. In today’s world, however, guaranteed monthly pensions are almost nonexistent in the private sector. 401(k)s and 403(b)s are the norm today, and it’s your job to determine if you’ve enough saved to provide the income you need for the rest of your life. It’s then your daily job to manage your money to provide the lifestyle sustaining income you need without running out. That’s quite a daunting task! It’s a very good question that has become more and more prevalent today given 24/7 media coverage of financial markets. It has become harder and harder to determine what’s relevant, what to pay attention to, and who’s correct! Let’s say, for example, that you want to “stay on top of things”, a valid desire that everyone feels they should be doing as a responsible retiree in today’s day and age. And, in order to do that you read the financial newspapers. You listen to market updates. You watch the news on television, and you click in and follow financial websites like Yahoo Finance, Market Watch, and MSN Money. What’s Next for China’s Foreign Reserve Fall? Please take a moment to go back and re-read those again. These are the exact headlines that appeared that morning. I couldn’t make them up if I tried! Before I comment on them in the next edition of The Strategy of the Week, I’d like to ask you to take some time to really dig into each headline by itself, and then in relation to all the others. As a result of reading them, do you feel as though your desire to “stay on top of things” has been satisfied? Did you reach any financial conclusions that you were able to act on? Have any or all of them helped increase your financial confidence? Please take some time to really think about these very important questions. I look forward to continuing our conversation!